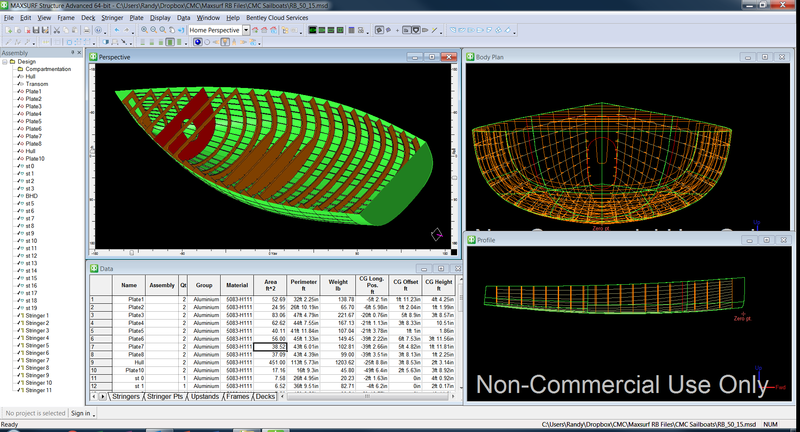 Maxsurf Structure is included as part of the Advanced and Enterprise Suites, providing the capability to model primary hull structure utilizing the Maxsurf NURBS surface model. 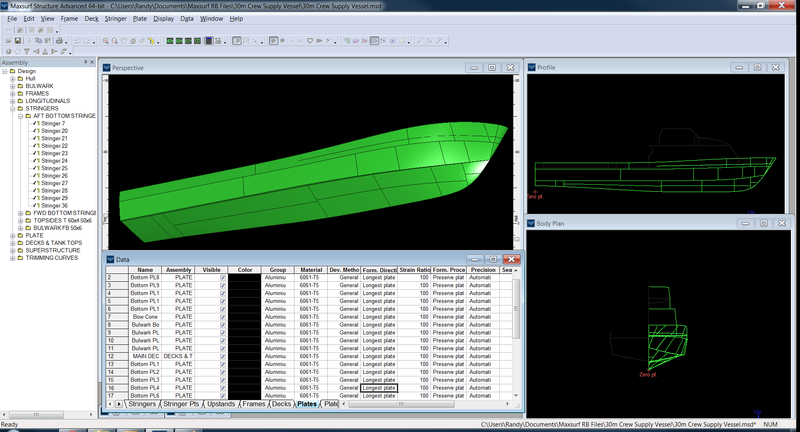 All parts created in Maxsurf Structure are parametric, meaning that the parts can be more easily updated when the Maxsurf surface model of the hull is changed. 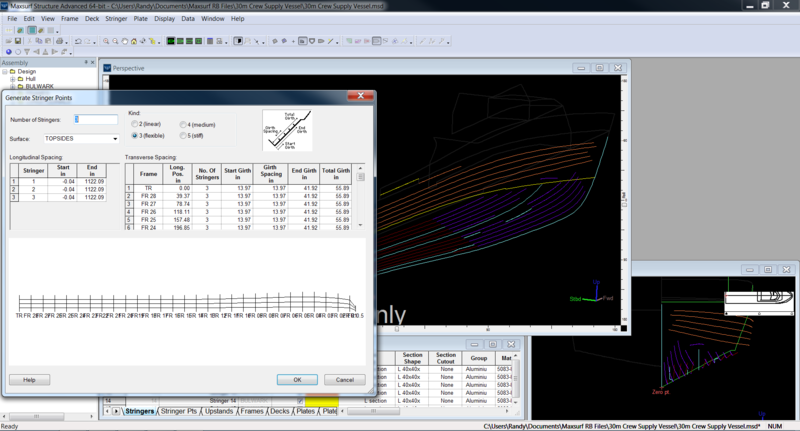 Certain changes to the hull geometry (such as a change in the beam or final hull fairing) can be performed in Maxsurf Structure automatically. To see a demonstration of this powerful capability, click this link. Note: Other more significant changes, particularly in the longitudinal or vertical direction would require more manual updating of the structural parts. The degree of automatic vs. manual updating due to hull changes depends upon the magnitude and direction of the changes. 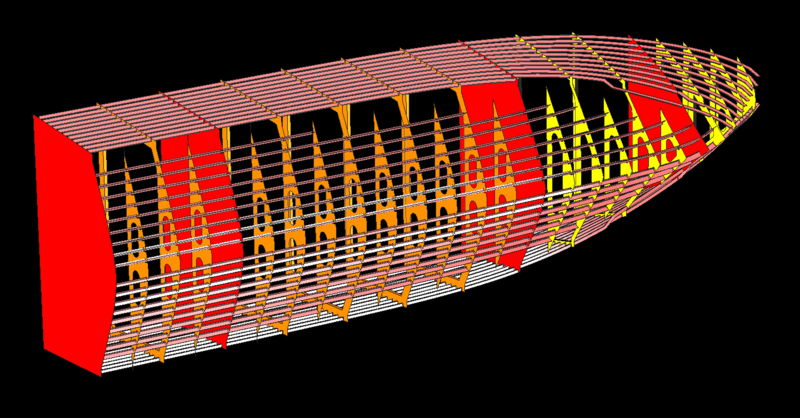 Maxsurf Structure facilitates the modeling of the hull structure concurrently with making final adjustments to the hull design details (such as fairing, bow thrusters, bulbs in the bow, keels, bulwarks, and appendages). 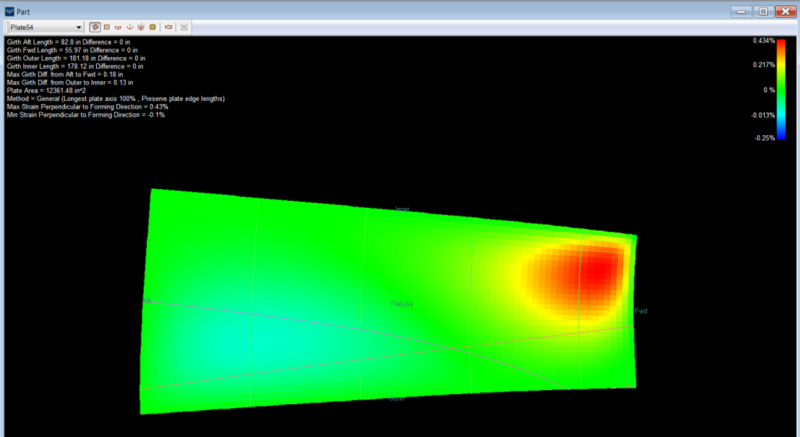 Structure defined directly with the hull model will be parametric and more accurate. 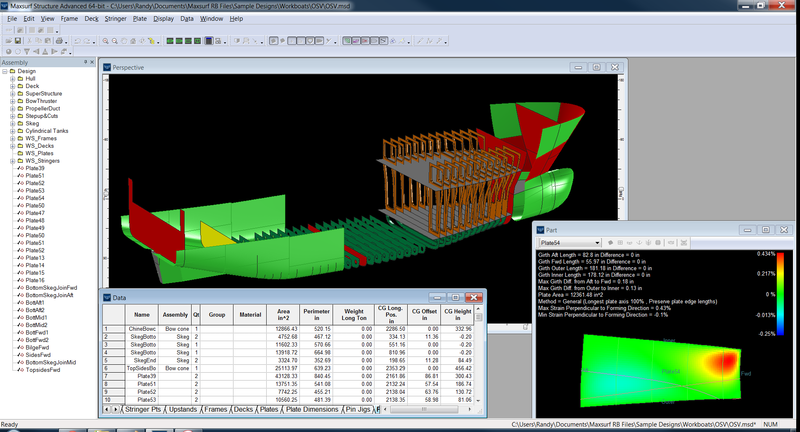 Several types of changes to the hull down stream can be easily incorporated into the hull structure part design with a few clicks of the mouse without the need to re-model structural components such as frames, stiffeners, and hull plates. 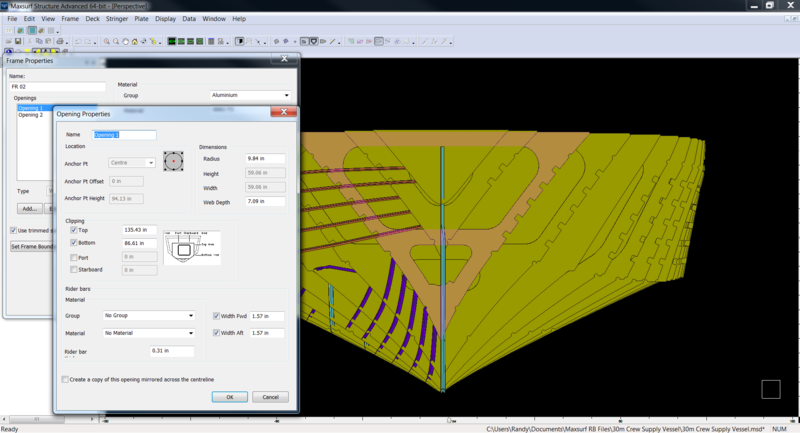 The intelligent 3D model data of the parts, material lists, weights and centers, plate dimensions, forming lines, frame lines are established earlier and can be leveraged for evaluation and other required iterative studies such as arrangements, stability, strength, and motions. 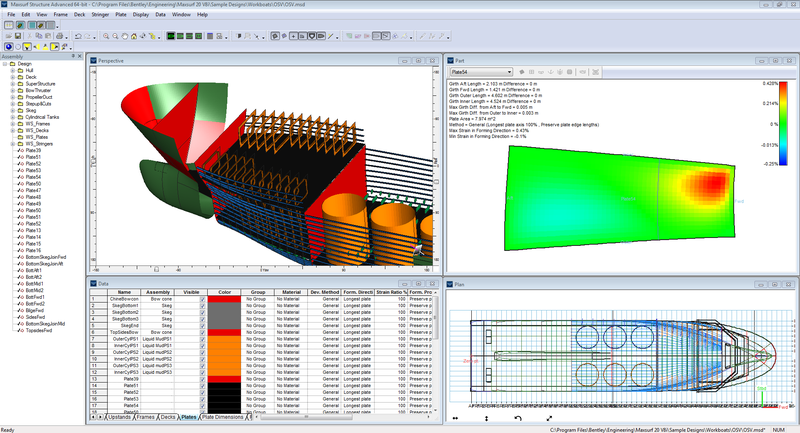 After all of the preliminary analyses and calculations are completed (more easily with the other Maxsurf modules such as Stability, Resistance, Motions, and Multiframe ), all of the structural parts data can be exported to a CAD System such as Autocad, Rhino, Solidworks, Microstation, or ShipConstructor for additional detailing. Coming from a fair Maxsurf hull model, the parts will be more accurate and precise, savings many labor hours in structural modeling and detailing. Automatic update of structural parts due to changes to hull design. Automatic or manual generation of longitudinal stiffeners (stringers). Stringer shape and cutout definition in frames. Stringer development on the hull surface. Plate development of developable plates. Plate expansion of non-developable plates. Plate forming templates and pin jigs. Export of all parts to ShipConstructor, AutoCAD, Microstation, Solidworks, Catia, and many other CAD/CAM Systems via DXF and IGES. Export of all parts to a native Rhino ,3dm format. ** Maxsurf Structure is a Naval Architecture tool best utilized in addition to a CAD System for the production of shop drawings.